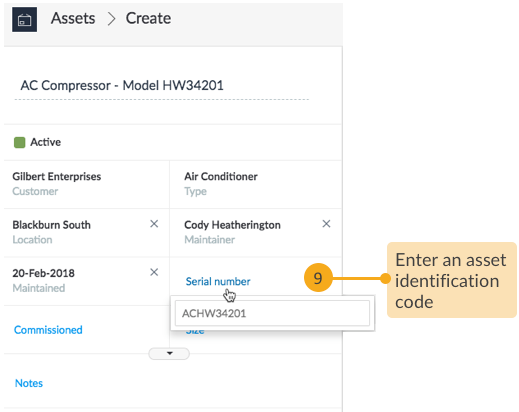 In Loc8, an asset is a broad term used to define any physical object in the real world that requires tracking and maintenance. This could be a building, floor or room, or it could be an air conditioner or a laptop. 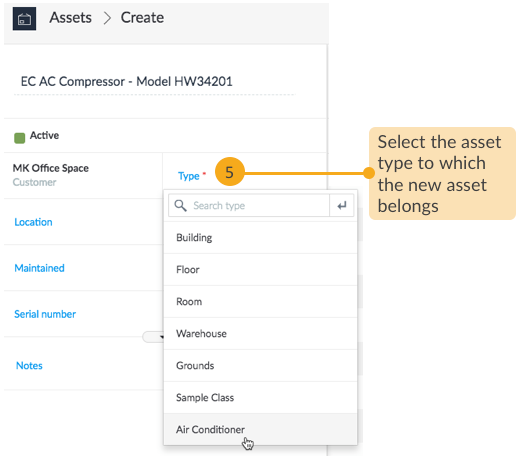 The type of asset can be specified when it is first added to Loc8, along with a host of additional fields that help define its properties. This article takes you through the steps of creating an asset in Loc8 accessed via browser, touching upon the mandatory and optional steps. IMPORTANT: You must have the asset type in place before you start creating an asset, and if the asset must be recorded with any specific parameters (say size, threshold temperature, etc.) that should be linked to the asset type before hand. 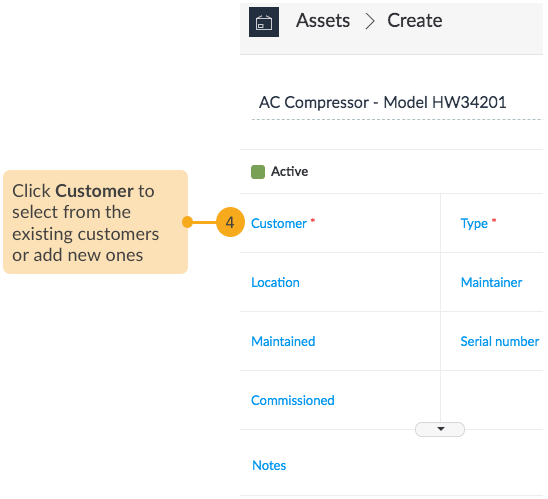 To understand the basics of assets in Loc8, please read Introduction to Assets and Sites. You can also create asset from Loc8 Mobile app. To know more, please read Create Asset in Loc8 Mobile. The asset type for the asset. 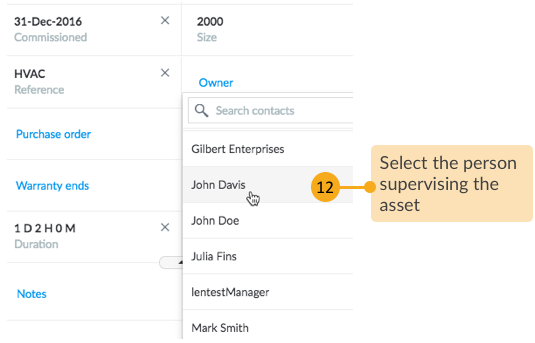 The required asset type must have been created in Loc8, preferably in hierarchical order (it is the hierarchy of the asset type that will organise all the newly created assets in form of an asset tree). 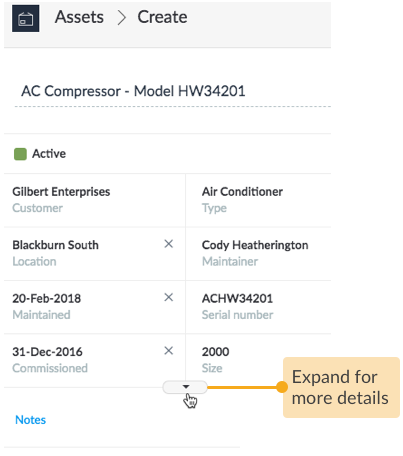 Any mandatory features/attributes/conditions that are to be recorded for the asset have been already defined as custom parameters in asset data groups and added to the relevant asset type. STEP 1 Go to the Assets page. STEP 2 Open Asset creation wizard. 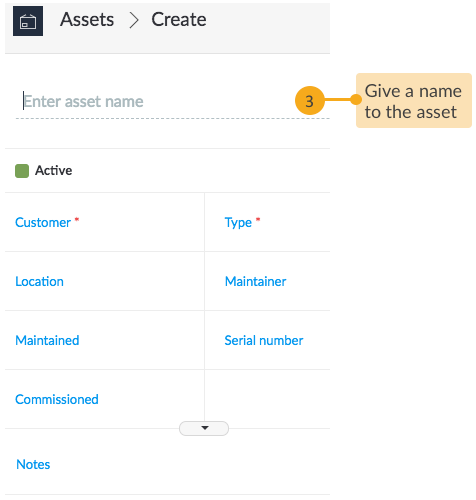 STEP 3 Fill in a name that easily distinguishes the asset from several other assets of the asset type. 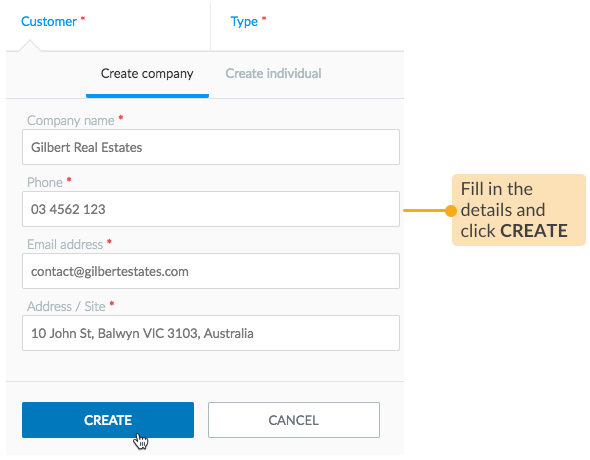 STEP 4 Specify the name of the person or company who owns the asset. 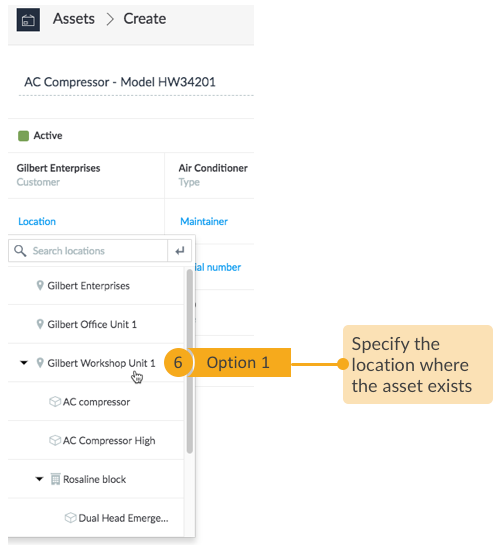 STEP 5 Select the asset type which best categorises this asset. If the required asset type is not yet created in Loc8, you can do that right now. 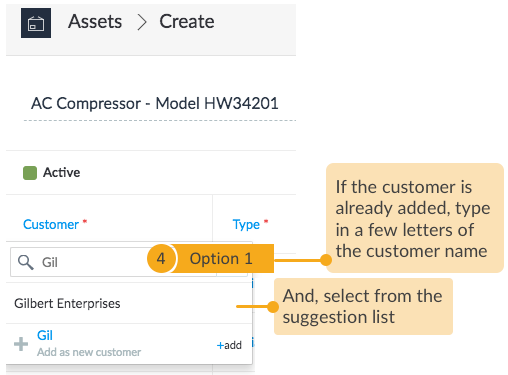 Just open your Settings area in a new browser tab and follow the steps in Create Asset Types. NOTE: All the steps from here onwards are optional, though they help you to create an asset with complete end-to-end details. 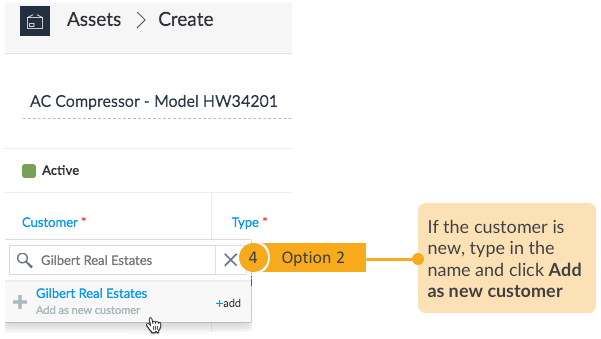 If you wish, you may do them later as explained in View and Manage Assets and Sites, and for now, directly jump to the last step to finish asset creation. STEP 6 Specify the location where the asset is physically situated. 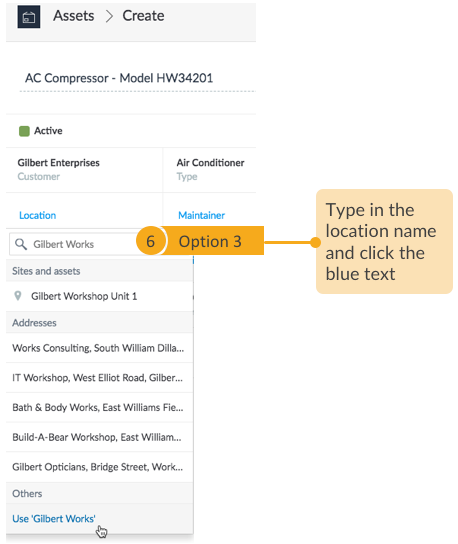 Option 1: You may select an existing customer site or asset, upon which its address will automatically show here. Option 2: You can directly provide the address. Option 3: You may type in a location name, which could be just about anything that identifies the place where the asset is located. 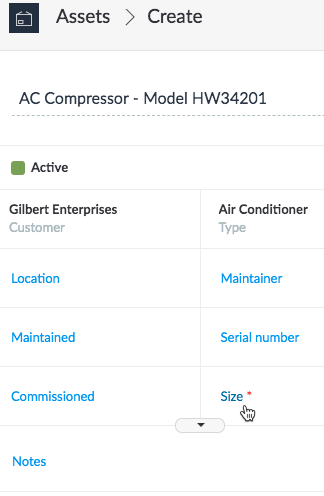 In the example below, a label has been used to indicate that the asset is set up at a section of the customer's office called as 'Gilbert Works'. 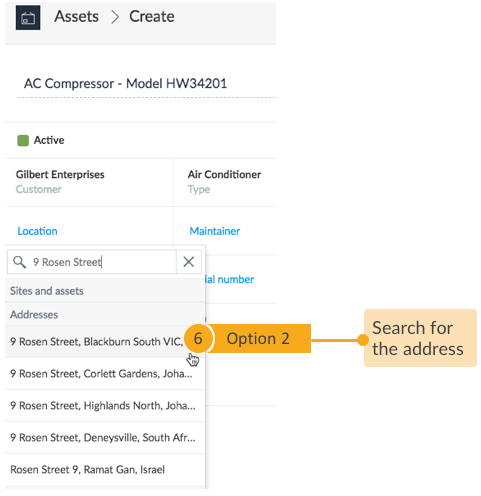 You can anyway update the location with a valid address, if necessary, once you've completed the asset creation. 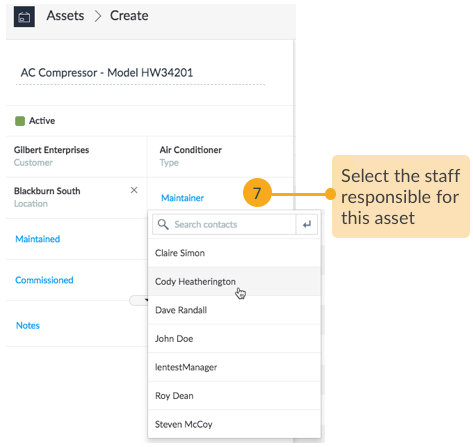 STEP 7 Assign a member of your workforce as the asset maintainer, who will be the single point-of-contact for managing one-off requests, handling issues at the site, or maintaining preventative maintenance schedules for this asset. STEP 8 If the asset was previously maintained before its creation in Loc8, enter that date here. 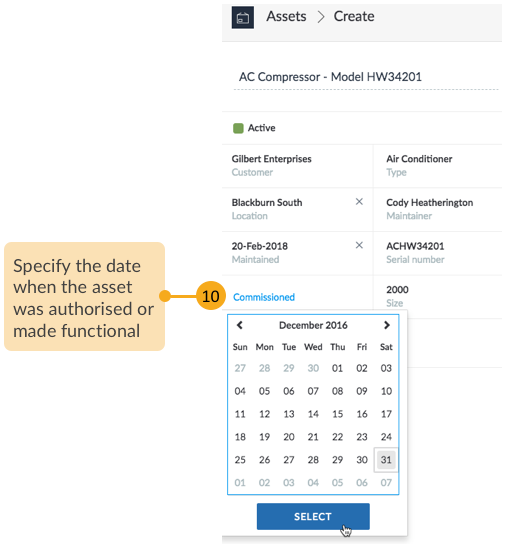 This helps in setting up subsequent maintenance schedules for the asset. 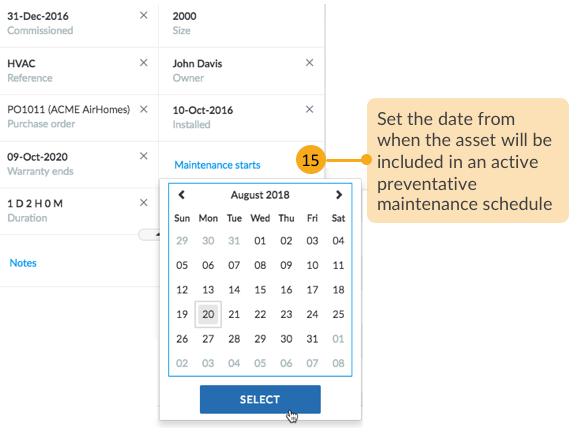 However, you may also choose to leave it blank for now and let Loc8 take care of updating the last maintained date, which gets automatically updated as soon as your workforce completes a preventative job that was scheduled for this asset as part of your maintenance plan. To know more about maintenance plan, schedules and preventative jobs, please read Set up Maintenance Plans. STEP 9 If the asset is a manufactured item, record its serial number or barcode number here. STEP 10 Add the date when the asset was made live and functional. STEP 11 Add a reference name or number for the benefit of marking assets as per your company's convention. STEP 12 Assign a person who will supervise and manage the asset, but might not necessarily take part in completing any jobs for this asset. 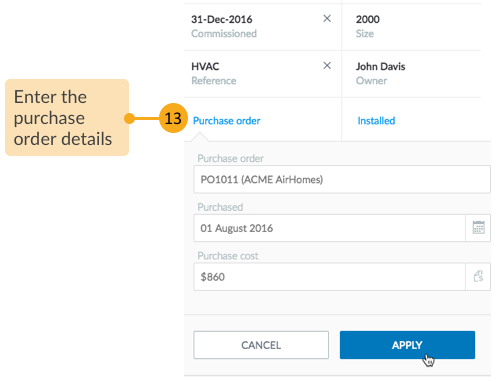 STEP 13 Add the purchase order details so that you have the asset's purchase history readily available whenever required. 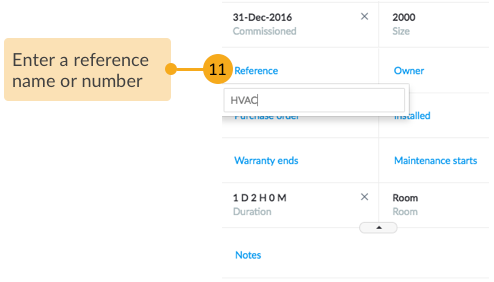 STEP 14 Provide the date when the asset was installed at the specified location and when the warranty expires. 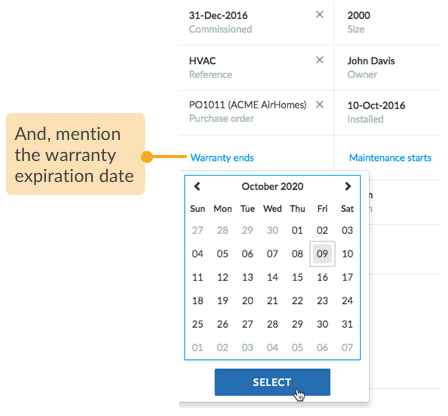 The installation date and warranty expiration date will supply more details on the asset's profile and accordingly help you determine follow-up maintenance requirements of the asset. 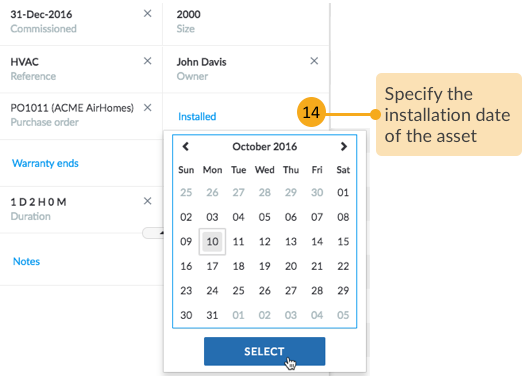 STEP 15 Specify the date from which this particular asset must be made eligible for preventative maintenance schedules that are already active and running on its location. 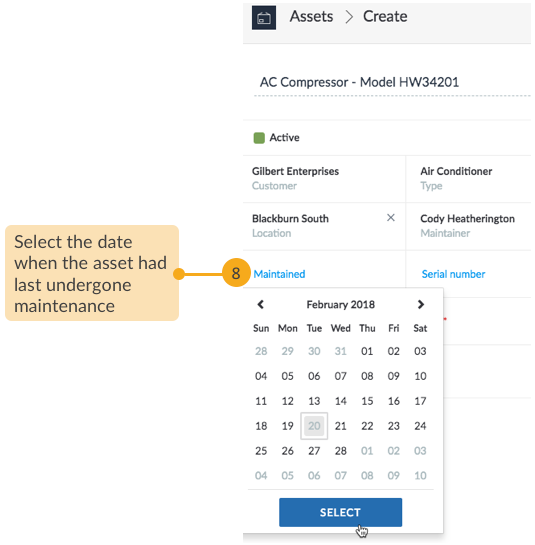 After the Maintenance Starts date, jobs will be automatically created for the asset based on the task frequencies that have been defined in the preventative maintenance schedule. To know more about preventative maintenance schedules, please read Set up Maintenance Plans. INFO: If you do not provide any Maintenance Starts date, the asset creation date will be considered as the maintenance start date by default. 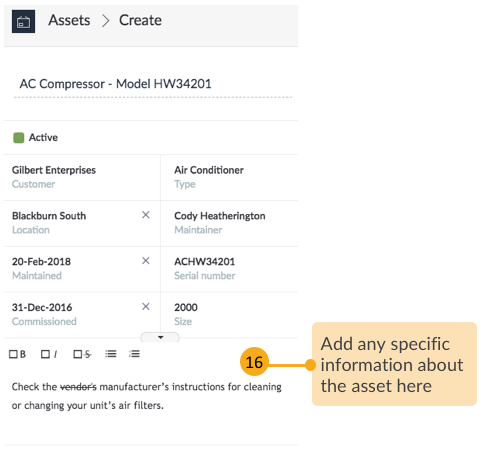 STEP 16 You may also add a note with specific details about the asset to keep your team informed about certain facts and considerations about the asset. STEP 17 Lastly, go ahead and create the asset. That's done! The asset is now created and will be displayed in the Assets area. 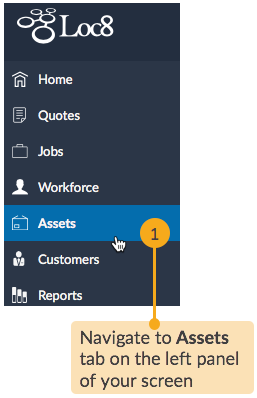 Next up, you can create one-off jobs for this asset right from its asset inspector or update the asset profile. To know more, please read View and Manage Assets and Sites.